An older picture of an Ebay auction showed up again in my documentation. I remember having it stored because of the seemingly odd, never recorded brick red colour. At first is seemed to me to be a no. 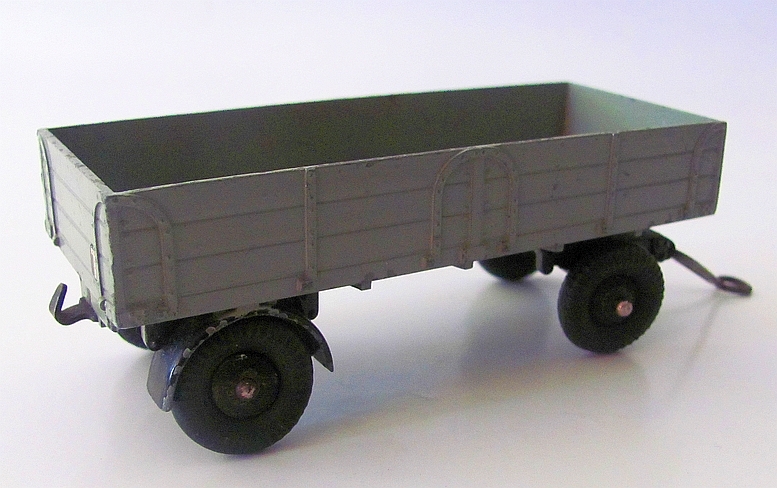 551 Large Trailer indeed, an early version with ridged Dinky Toys hubs and grey round tread Dinky Supertoys tyres. 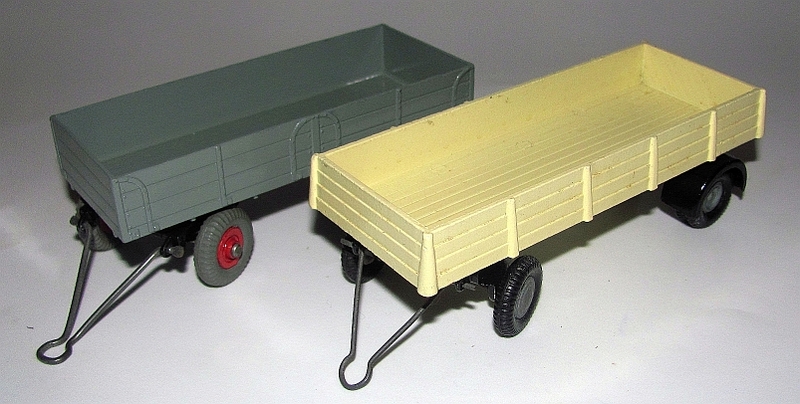 But then, looking more closely, and comparing with my own trailers, I realized that itâ€™s just its French brother, the no. 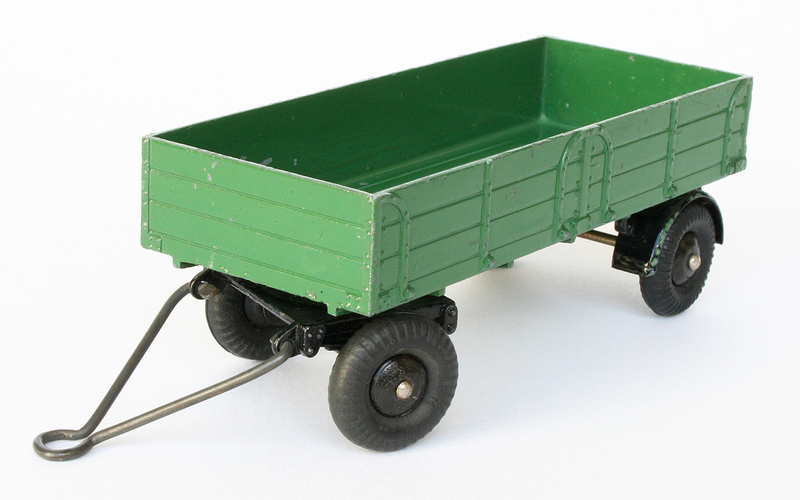 70 Remorque BÃ¢chÃ©e, the covered trailer, but now as a look-alike, being rather unrecognizable without the hood. The fresh, shiny maroon red of the new model has suffered in all those years, producing a kind of brick red colour, as used for instance for the early no. 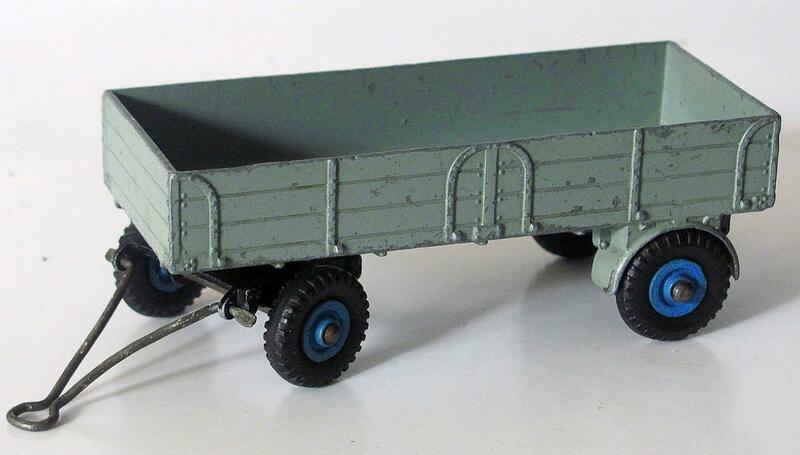 501 Foden Diesel 8- Wheel Wagon. And of course this has nothing to do with the real, late red no. 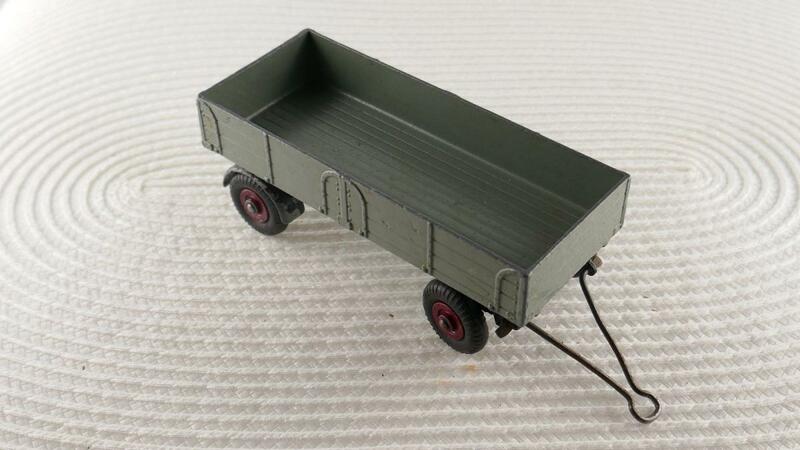 428 red Large Trailer which was available almost 20 years later! I can help with pictures of three of your 'wants'. P.S. : Remarkable that the late one with red plastic hubs comes with a much older box, as it seems. And that one appears to have no crimped drawing bar ends either! 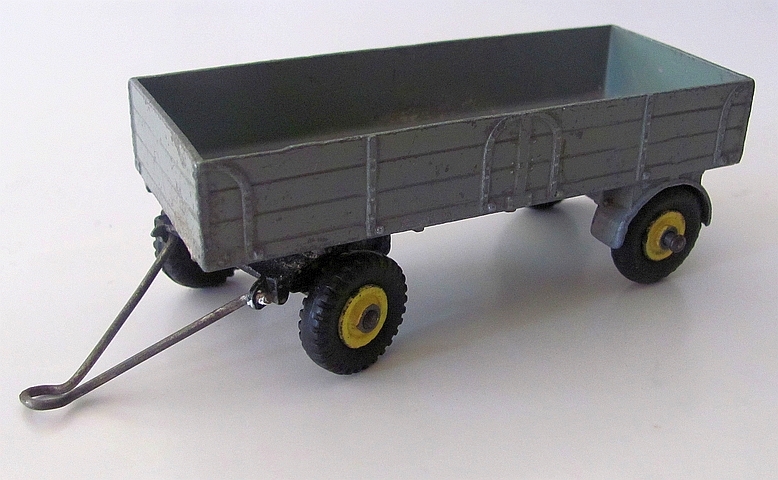 I should have known better than to use the 'wrong' box with the plastic wheeled #428 trailer. The original box was in much rougher condition - plain red and yellow with the end flaps missing. Here is another photo of it without the box. Also a Trade Pack different from yours in green without the multi-lingual description. 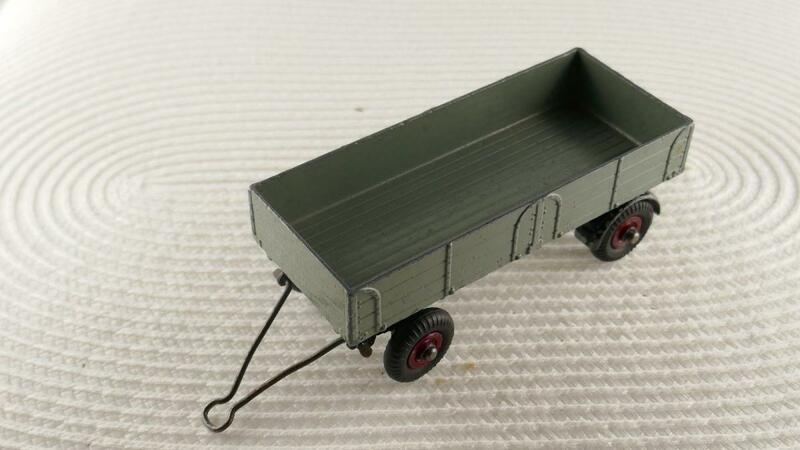 Finally, the large trailer was copied by Micro Models (Australia/New Zealand), but much cruder depiction of the sides, but it does have dual wheels at the back. And here is a yellow version, very well played-with but original. 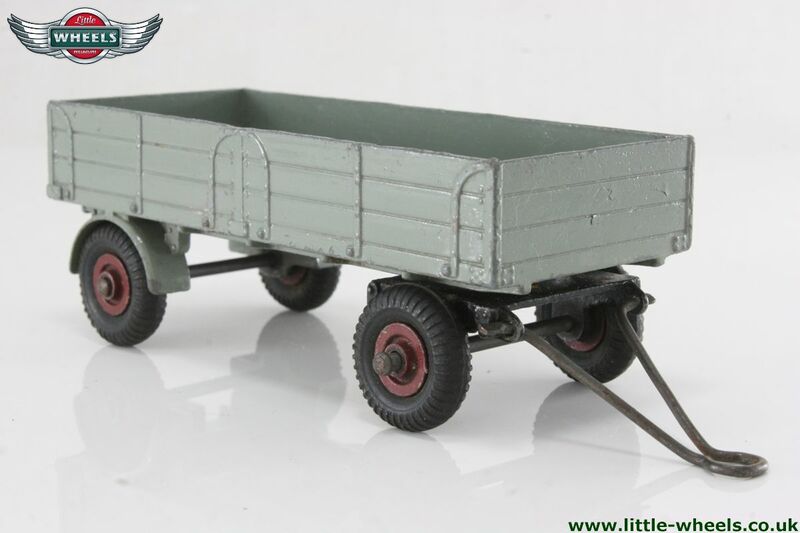 I have just received a 428 large trailer with blue wheel hubs. The camera sure shows up all the chips! 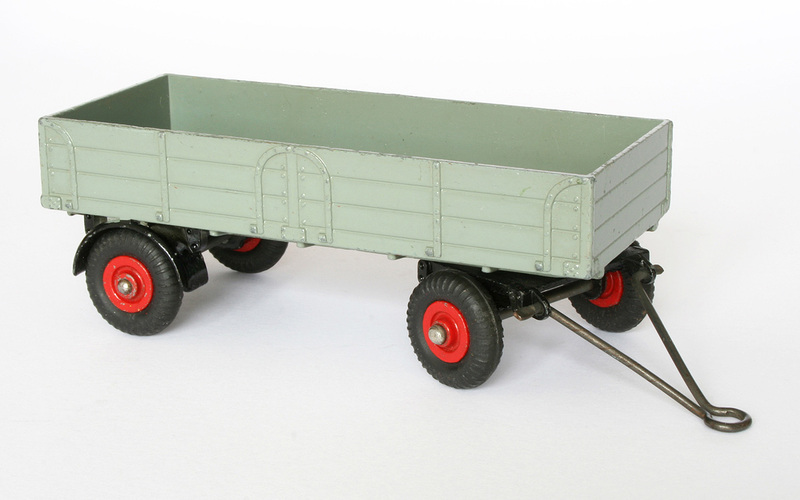 Hi all, I have just acquired another 428 Large Trailer with plastic hubs - this one has a correct box I think? 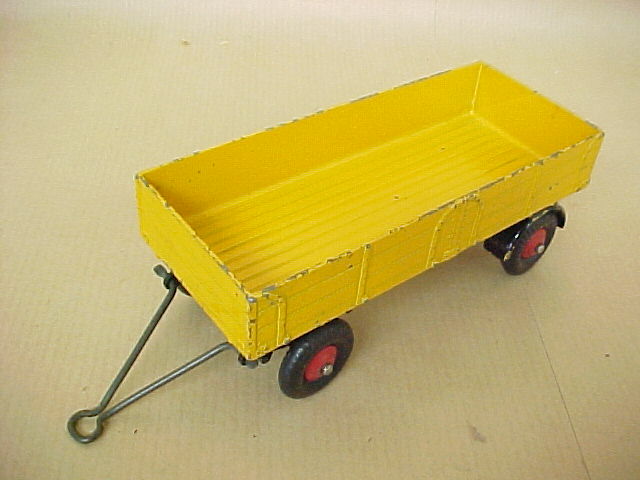 Personaly I am for a long time looking for a yellow one to combine with my Bedford articulated Lorry, but what I found till now are all heavy chipped overall. I'm looking for an excellent and affordable example for almost 20 years already, but indeed, most of them are heavily chipped - and so obviously on these bright models. I have eleven large trailers now, except for two identical models from a trade box, all different. Still looking for four variants: the yellow one, grey with black, red plastic, cream and blue hubs ... 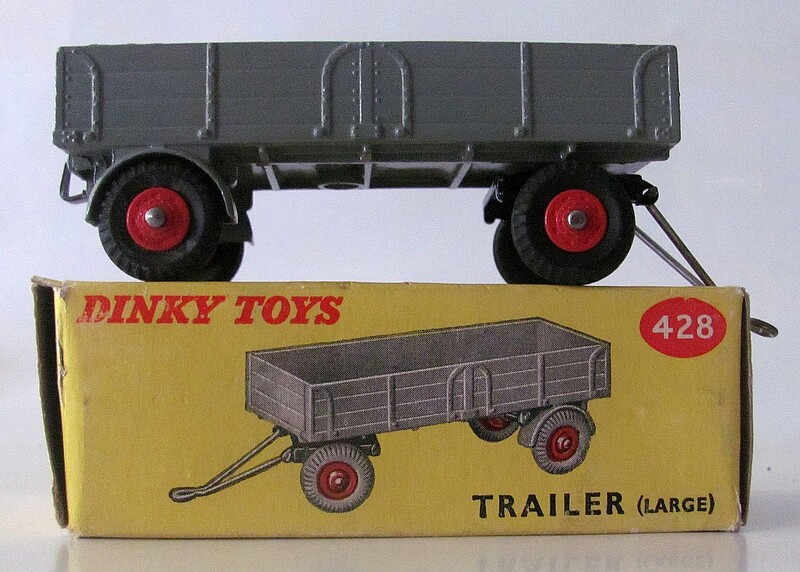 I am not particularly a variants collector, but the Large Trailers are generally so very cheap to find, very common. Jan. Indeed the earliest versions usually have black mudguards. 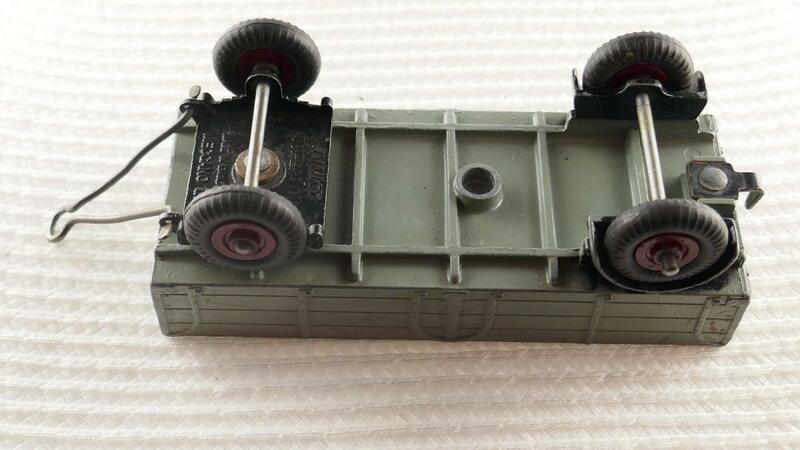 At least I know that about the Bedford Articulated Lorry. It is not entirely visible on the photos of Ebay, but it seems me that the support between the rear mudguard and the body of the Ebay one is also narrower than your example. 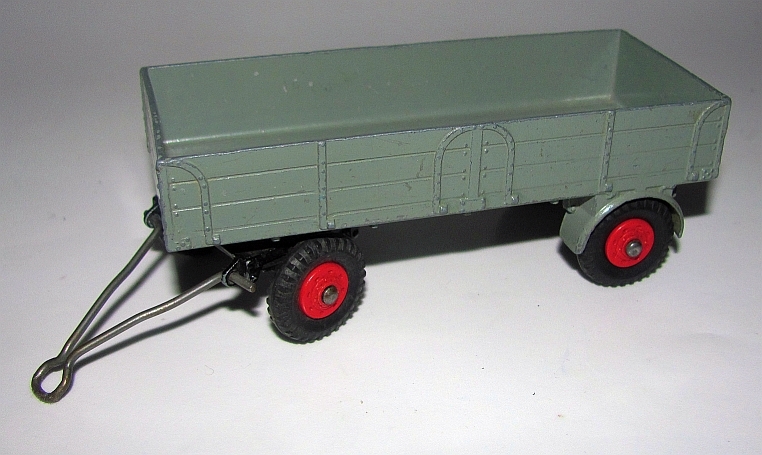 I have just acquired a nice, boxed example of the late 428 red trailer. 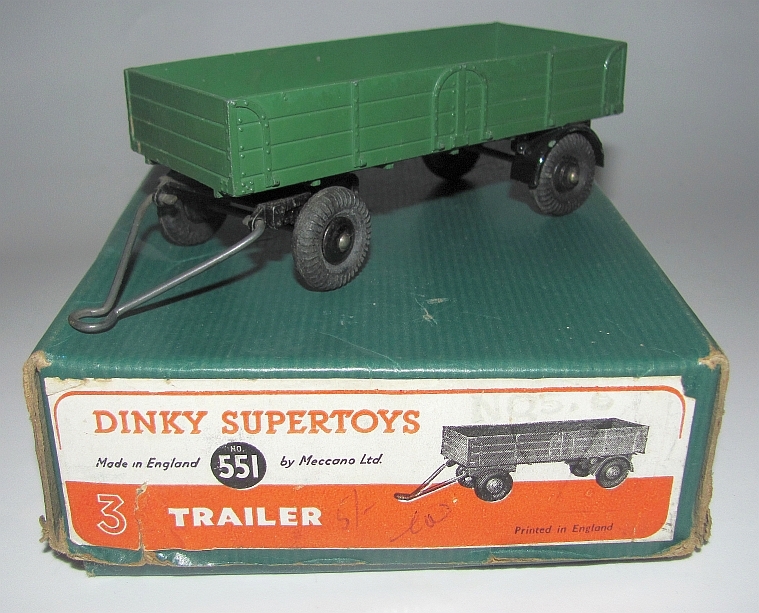 There is no reference to either Dinky Toys or Dinky Supertoys anywhere on the model. The only markings are "Made in England" and "Meccano Ltd." on the forward end of the turntable. The opposite side, where the "DT" or "DST" wording is normally found is totally clear, no trace of any lettering whatsoever. Are all examples of late 428 trailers the same? 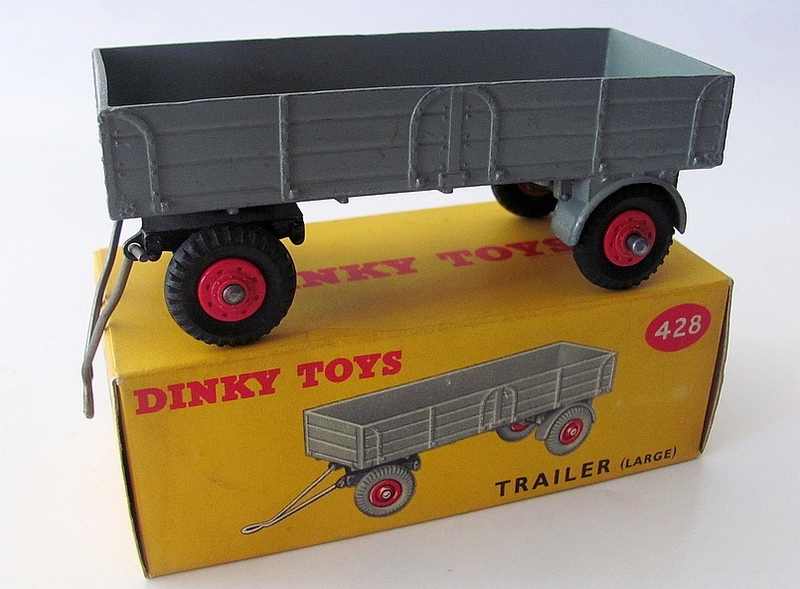 Thanks for that explanation, Jan. All of my 551/951 trailers are marked with Dinky Toys or Supertoys, so now I must look for a grey one without the branding !